Posted in: Brian's Presentations. Tagged: dust devils, geoscience. Posted in: Brian's Presentations. Tagged: close-in exoplanets, ultra-short-period planets. Posted in: Other Seminars. Tagged: astrobiology, early earth, hadean earth. Artist’s conception of early Earth. The Earth is about 4.5 billion years old, and it’s seen some dramatic events during that time – from the giant Moon-forming impact to the advent of fidget spinners. 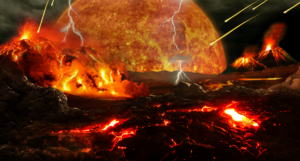 The earliest phase in the Earth’s history, called the Hadean, was hellish. During long stretches, the surface was probably molten, the atmosphere was toxic, and there were no oceans. Eventually, though, the Earth transitioned to its current hospitable condition, and life got a toehold by at least 3.5 billion years ago. But today in the Boise State Geosciences seminar, we heard about possible evidence for life going back almost a billion years earlier from Dr. Elisabeth Bell of UCLA’s Earth, Planetary, and Space Sciences Dept. 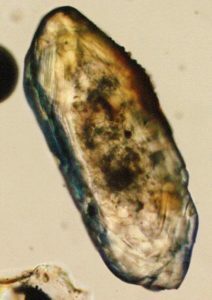 Optical microscope photograph; the length of the crystal is about 250 µm. Dr. Bell’s work focuses on the hardiest of all mineral grains, the mighty zircons. These little rocks can be smaller than the width of a human hair, but they provide some of the strongest clues about conditions on the early Earth. The mineral from which they’re made is very tough, and so weathering processes that usually break down other minerals barely affect zircons at all. Consequently, zircons that formed billions of years ago still retain their integrity, and, like the amber from “Jurassic Park”, often contain treasures in the form of other minerals. Dr. Bell and her team analyze these mineral time-capsules to learn what the early Earth was like. One of the most exciting finds from her work comes from the Jack Hills geological formation in western Australia, where rocks almost as old as the Earth can be found. Inside these rocks are even older zircons, dating back to 4.1 billion years ago, which themselves have trapped small grains of graphite. By analyzing the isotopic composition of these graphite grains, Dr. Bell has found tantalizing evidence for chemical processing of carbon that resembles biology. Although the evidence is still tentative, the results suggest life on Earth started chugging away smack in the middle of the Hadean, much earlier than has previously been believed. Taking a step back, such a result suggests that life may get started on an Earth-like planet very quickly, which could mean that life is an almost inevitable outcome of the evolution of Earth-like planets. Given how common Earth-like planets may be, that could mean the universe may be replete with at least simple life. Posted in: BSU Journal Club. Tagged: fast radio bursts, SETI. At the research group meeting today, we discussed the recent reports of additional fast radio bursts (FRBs) originating from the mysterious source FRB 121102 by the Breakthrough Listen search for alien communications. 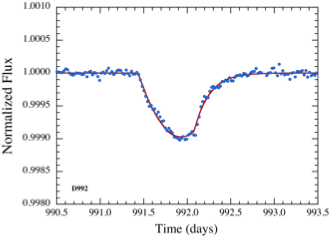 It has been proposed that FRBs are some kind of alien signal. In fact, Lingam & Loeb at Harvard earlier this year suggested FRBs might be beams of light used by aliens to accelerate alien ships into space. Probably not, but a very cool suggestion. One of the neatest responses to this recent detection was the conversion of the radio signals into audio by redditor u/Arzu1982, which I’ve linked to below. Not sure that the audio provides any insight into the origin of the FRBs, but they are neat to listen to. Posted in: BSU Journal Club. Tagged: exocomets, Kepler mission. Very neat paper recently published about the possible discovery of comets orbiting a distant star found using data from the Kepler mission. To find the elusive exocomets, a group led by Prof. Saul Rappaport at MIT conducted an exhaustive search of more than 200,000 lightcurves collected by Kepler over its 3.5 year nominal mission. By meticulously sifting these lightcurves by hand, Rappaport’s group were able to spot strangely and non-periodic signals, the kinds of signals that computers, with their rigid predictability, have trouble finding. The shadow of an exocomet. The figure at left shows the shadows of exocomets orbiting a very bright star, a little bigger than the Sun, as they pass between the star and the Earth. The cometary signal is asymmetric and doesn’t occur on a regular schedule, totally unlike an exoplanetary transit. Rappaport’s group reports seeing six of these strange signals coming from the Kepler target star. Probably most of the signal is coming from a cloud of dust ejected by the exocomet. Such dust ejections are common for comets in our solar system, giving rise to one of the two lustrous tails usually seen for comets (the other tail is made of a stream of ionized plasma). By fitting a simple dust model to the shadow signals, Rappaport and colleagues estimate that their exocomet is shedding dust at a rate of about 20,000 tons per second, roughly equivalent to the total mass of meteors that burn up in the Earth’s atmosphere every year. The shadow signals appear six times, separated by tens to hundreds of days. Assuming the two dips separated by about 200 days are due to one comet (they don’t have to be), the comet would have to contain about as much mass as Halley’s comet and probably more.